We had to make a highly unplanned trip to the mall so that R could buy some bidness clothes. Well, we didn’t actually end up finding any, but we did get hungry. So they made me go to Maggiano’s. There aren’t that many options at 9PM! The food court is closed and you know, the other choices are just as chainy. R did us all a big favor and asked for a pitcher of water for the table. Oh boy. Our server said no, but then he made it a point to fill each of our glasses with every sip we took. And he filled it to the tippy top. This was a point of amusement for the whole entire evening. 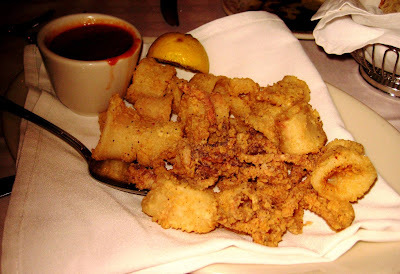 Calimari! H/A orders appetizers last minute without planning. This is just what he does. Apparently, he can’t not order appetizers. I’m not an appetizer person. I want the main event. But this calimari was quite good. The ravioli. This normally comes with an alfredo sauce, but none of us were into that, so we asked for it to be made with marinara. 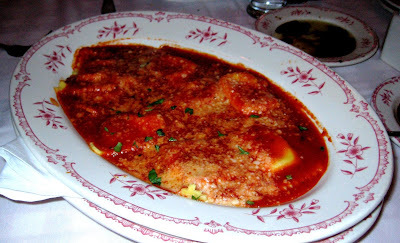 The ravioli themselves were good, but the sauce was strangely sweet. Still ok, but unexpectedly sweet. 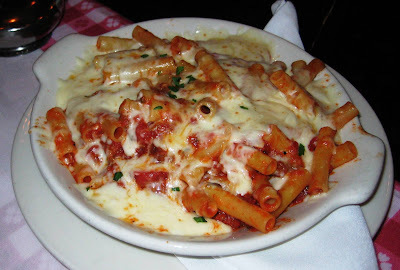 The baked ziti and sausage. This sauce was not sweet! I really enjoyed the sausage in this. There were little tiny bits of sausage in there. I wish there had been more… they seem to skimp on the meat here. I enjoyed the food here, but it’s not like amazing. It’s just ok. And the prices are ok too, but just ok, not cheap. And you get decent amounts of food. The service was a bit overzealous, due to the water incident. But there was a severe lack of communication due to our server’s lack of proficiency with the english language. When H/A wanted the rest of the ziti packed up, nothing happened. Bye bye ziti.